PT Perusahaan Listrik Negara (Persero) – PT PLN (Persero) or known as “PLN” is the Electricity Company of Indonesia. 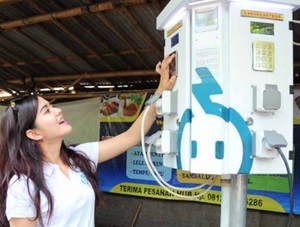 PT PLN (Persero) is the national electricity company of Indonesia, fully-owned by the Government of Indonesia which represented by the Minister of State-Owned Enterprises (SOE). PT PLN (Persero) is the only state-owned company in the electricity power sector in Indonesia. PT PLN (Persero)engaged in integrated electricity. Its business include generation, distribution, transmission and other electricity related services. PT PLN (Persero) has a right to monopoly on electricity distribution in Indonesia. PT PLN (Persero) was first established in 1945 as Jawatan Listrik dan Gas under the Department of Public Works and Energy. Based in Jakarta, PT PLN (Persero) now has 15 area offices, 6 distribution unit offices, 2 Distribution and Load Control Centers, 6 Generation units, 14 Parent Project Units and 6 Central and Services Units spread across Indonesia. PT PLN (Persero) also supported by 11 key subsidiary companies.